2003 reissue. "This enhanced re-issue includes ten highly desirable bonus tracks in the form of live versions of eight songs from the group's debut album, recorded in Texas and San Francisco, an instrumental version of 'Levitation,' as well as a previously unreleased studio gem, 'I Don't Ever Want To Come Down.' One of the pioneer psychedelic groups of the '60s, The 13th Floor Elevators released four remarkable albums on the highly-regarded Texan label, International Artists. Fronted by the legendary and truly eccentric visionary Roky Erickson, the group has enjoyed sizeable cult status ever since their ground-breaking single, 'You're Gonna Miss Me' made the U.S. charts in 1966. Their first two albums are widely recognized as being landmarks of their era. 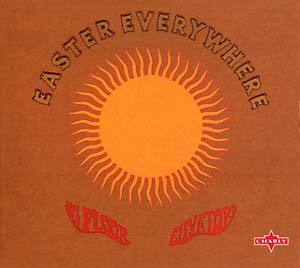 The group's second album for International Artists, 1967's Easter Everywhere is essentially an extension of the sound of their debut album. Another bona fide psychedelic classic, its standout tracks include the eight minute epic 'Slip Inside This House' and an inspired cover of Bob Dylan's '(It's All Over Now) Baby Blue.'"